wow, it seems like you really like Berti, which I now name Morgan (Batman). After sewing on the eyes I couldn’t see a Berti any longer, my bat was a little more grown up, if you know what I mean. Anyways, Morgan seems like an attention seeker ^__^ as I can see quite a lot of you reading the original post. Thank You! I finally made the pattern into a pdf now, so it’s easier to download and print and work from your computer. 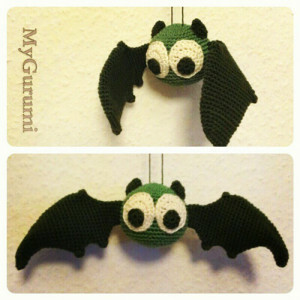 If you make a bat of your own I’d love to see it, either on ravelry or just leave me a link to your blog use the #morganbatman when sharing your pictures on social media. Thank you ^__^ and Happy Crocheting. #morganbatman is worked in classic amigurumi style, which means in a long spiral round, never join a round after finishing one. Also I like my amigurumi to be worked through both loops (whereas I know couple fellow amigurumi makers who prefer the back loop only). So do whatever you like best. I used catania yarn from Schachenmayr and my beloved 3.5 mm hook. My bat(man) has about 25 cm wingspan.